"Climate change is the greatest moral, economic and environmental challenge of our generation". So said Kevin Rudd just prior to being elected Prime Minister of Australia in 2007. Climate change is indeed the greatest challenge we face, but not for the reasons given by those who believe in anthropogenic (man-made) global warming. It is the greatest moral, economic and environmental challenge we face because the trillions spent on carbon emissions could more effectively address poverty, food, water, health, education and other social issues. The very things that are killing millions of people a year. We focus on carbon while millions die. We fiddle while Rome burns. It is the left wing's version of the War on Terror; an excuse to control, tax and legislate the populace more than ever. Strategies to reduce global warming are a war on the poor. Carbon tax is reverse wealth redistribution, taking money from citizens and distributing to big business under the auspices of "green energy". Is carbon dioxide (CO2) the demon? Is CO2 the killer? CO2 is a nutrient not a pollutant. Life flourishes in a greenhouse. Demonising CO2 is akin to the demonising of refugees and cannabis which were done for political or economic reasons. Proposed carbon reduction efforts will result in 0.18oC reduction in global temperatures in a century - a waste of resources for no return. Even if we successfully reduce our CO2 emissions, it will be a pyrhhic victory, costing the population of the Earth far more than the benefits gained. In 1979, Margaret Thatcher, leader of the Conservative Party became British Prime Minister. As the world's first female Prime Minister, she set about gaining international respect based on her scientific qualifications. Additionally, the Conservative Party blamed their 1974 election defeat on the National Union of Mineworkers, so as retribution had an agenda to replace the UK reliance on coal with nuclear energy. Nuclear power stations would also assist the UK in developing their military nuclear program. To achieve both respect for Thatcher through impressing with her scientific qualifications and more importantly destroy the power of the coal industry, the global warming theory of the 1880s was resurrected and the attack on CO2 emissions from coal fired power stations commenced. Margaret Thatcher raised her global warming theory with other world leaders who eventually saw her proposed "carbon tax" as a means to raise revenue, strengthen their economies and weaken the economic influence of the United States who had a major reliance on oil and coal based industries. Thatcher opened the Hadley Centre for Climate Prediction and Research and allocated funding to climate research. In 1988 the United Nations Environment Programme and the World Meteorological Organisation established the Intergovernmental Panel on Climate Change (IPCC). The IPCC uses the Hadley Centre for its research. The IPCC was tasked with proving anthropogenic global warming, not to find if there were alternative causes for it. Scientific research funding has always been a competitive and lucrative industry in itself. In order to justify the anthropogenic influence on global warming, governments began providing significant research grants to scientists who could link their research to man-made global warming. Government provides few, if any, grants to research other causes of global warming. Most of the research reported in the media and published in peer-reviewed journals supports anthropogenic global warming. There are scientists who do not support this theory, but their research is rarely published in journals and even more rarely published by the media. Anthropogenic climate change models are based on theoretical calculations, whereas models put forward by scientists such as Dr Roy Spencer are based on historical information and satellite data. Yet the results of Dr Spencer's research are not reported in the media, even though he disproves anthropogenic causes as being a significant factor in global warming. To achieve this the world requires market-based mechanisms, such as carbon taxes to raise trillions of dollars to supposedly reduce carbon emissions. All to save a paltry 0.18oC over 100 years. According to the World Health Organisation (WHO), 40 million people die per year. Of this 0.3% are attributed to global warming. Following the Copenhagen Climate Summit a consensus was undertaken of the world's top economists (this included 4 Nobel laureates) to determine the world's best economic opportunities for improving the world. This was based on the return on each dollar spent and was ranked as Very Good, Good, Fair and Bad. 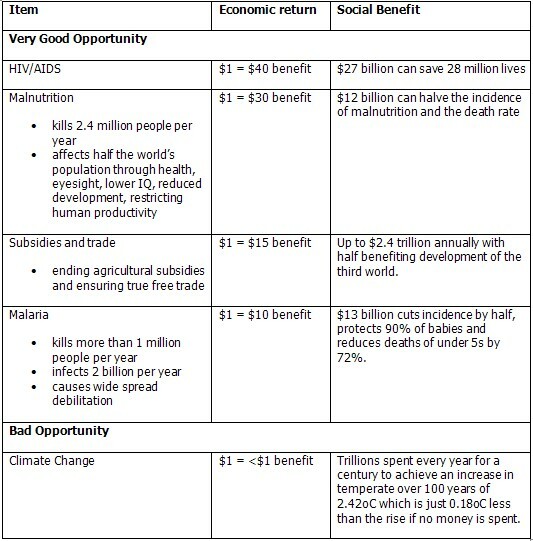 Interestingly, climate change was identified as a bad opportunity because it returned LESS THAN $1 for every $1 spent. As can be seen, many more lives will be saved and many more people's health and standard of living improved through directly addressing health and trade issues than by addressing the uncertainly of climate change). Increased wealth means that people can provide a higher quality of life for themselves and their children. IPCC claims that implementing the Kyoto Procotocols will reduce the world's hungry by 2 million people by 2080 at a cost of $180 billion annually. The United Nations estimates that spending $10 billion directly on a food programme would reduce the world's hungry by 229 million by 2080. The claim that climate change will cause more people to be hungry is rubbish. Taking action on climate change will cause more hunger through an opportunity cost of 229 million still hungry in 2008. The concern over anthropogenic climate change is diverting the social conscience of many people away from poverty and health to climate where there is little to nothing that we can achieve while the quality of life throughout many areas of the world worsens and the death rates from poverty and other social issues worsen. In essence, we are fiddling while Rome burns. People are dying from preventable causes while we focus on carbon. Carbon tax will take trillions of dollars from all citizens at all ends of the political spectrum and divert it to big business in the name of clean energy innovation. Prime Minister Gillard claims that pensioners and low income earners will be reimbursed for increased costs as a result of the carbon tax. This is a smoke screen. The carbon tax will be paid many times over by every citizen as the tax is passed on through all commodities, not just electricity. All products that we buy utilise electricity and oil in their production. Solely reimbursing low income earners for increased electricity costs will not cover increases passed on by manufacturers in food, clothing, consumables and every other product that we purchase. We are seeing the plutocratic nature of modern politics with the flexing of corporate muscle by large, industrial companies who have campaigned against the mineral resources rent tax. Whilst they may talk against carbon tax, the reality is that they will make money out of this by passing the cost on to the consumer many times over. Carbon tax will cost local jobs as businesses move production to countries which do not have a market based mechanism addressing carbon. Carbon tax will also have a negative rather than positive effect on reduction of carbon as companies will be importing goods produced in factories that do not have the same high level of pollution reduction that Australian factories have. Since the 1960s, Australia has introduced pollution reduction mechanisms in all factories. Note that this is not carbon reduction as there is no technology to remove CO2 from the manufacturing process. Pollution reduction in Australian factories has targeted real particle pollutants. Images in the media of factories pouring smoke from their chimneys are misleading. Most of the images are actually showing steam, not carbon. Steam is not pollution. Carbon tax is reverse wealth redistribution. rate of loss of infra-red energy to outer space. The current theory that mankind is the cause of global warming and that the world's weather is extremely senstive to greenhouse gases has over-stated the effect of CO2 as a greenhouse gas in reducing the rate of loss of infra-red energy. Yet water vapour, such as humidity and cloud, provides 90% of the Earth's greenhouse gases, CO2 is roughly 3% of the greenhouse gases, with the balance made up mainly of ozone and methane. Climate change believers will argue that increased water vapour, caused by higher temperatures evaporating land based water reservoirs and the oceans, will amplify the effect of higher CO2 levels, yet this is a circular and fallacious argument. Water vapour merely stores heat of its own merit, it does not force CO2 to react any differently. clouds - Dr Roy Spencer has reported that clouds (or lack thereof) cause warming or cooling. Increased cloud coverage reflects more solar radiation which keeps the globe cooler but will also insulate more of the Earth's heat which assists in maintaining existing temperatures. Decreased cloud coverage allows more solar radiation to warm the Earth (2).The IPCC has made the naive claim that cloud coverage remains static when evidence is quite clear that cloud coverage fluctuates. Factors such as land use, ice, snow and vegetation. Historical fluctuations in climate such as the Medieval Warm Period and the Little Ice Age. In fact, there was an effort by scientists to remove the Medieval Warm Period and the Little Ice Age from history through the introduction of the "hockey stick" report of climate variation by Michael Mann, Bradley and Hughes. The "hockey stick" flattened the effects of the Medieval Warm Period and the Little Ice Age by utilising tree rings as a measure of temperature and then to use a satellite data to measure the last 30 years. This is not comparing apples with apples. Consider that tree rings did not record the high temperatures of 1998 (which is acknowledged as the hottest year for which records exist). However, it is generally accepted that temperatures during the Medieval Warm Period were hotter than they were in 1998. 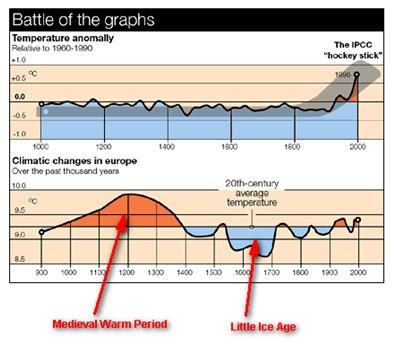 Below is the "hockey stick" and the originally accepted temperatures of the Medieval Warm Period and Little Ice Age. Climate change models have focused on forecasts and theoretical projections based solely on CO2 without considering other factors. When compared to the multitude of variations that impact weather and climate, CO2 is minimal. Relying on these climate change models is similar to the scenario in Hitchhiker's Guide to the Galaxy in which the smartest minds in the universe built a computer to calculate the "meaning of life, the universe and everything". After thousands of years, the computer gave the answer "42". When asked what the answer meant, the computer told them that the answer wasn't the problem, it was the question that they did not understand. Those who question the answer "holistic and cyclic factors", do not understand the question "what is the meaning of man-made climate change". Instead of considering all the evidence, they disregard that which does not give them the answer they want. In the 1930s newspapers reported the melting of the polar ice caps. In 2007 the thawing of the North West Passage was reported as "unprecedented". Yet in the 1940s ships were able to navigate the North West Passage without an ice-breaker. Al Gore and other scientists have presented evidence of glaciers melting to prove their concerns and link this to CO2 emissions. The fact is that glaciers have advanced and receded many times over the last 12,000 years. We are coming out of the Little Ice Age so it stands to reason that glaciers will recede during a warming period. This is not evidence that man is to blame for it. It is also not the answer that proponents of anthropogenic climate change want to hear. During the Medieval Warm Period in the 11th century, Alaska was up to 3oC warmer than today and the snowline of the Rocky Mountains was 300m higher than it is now. In the winter of 1693, around 2 million people died in France from the severe cold weather. Harsh winters of the Little IceAge caused famine and more deaths than occurred during the Medieval Warm Period when food and crops were plentiful and people were warm. Even with all the focus on climate change and carbon emissions, there is evidence that there has been no global warming since 2001. Carbon based life-forms populate the Earth. Carbon is not a pollutant, it is the essence of life on Earth; without it there would be no plants, no animals, no mankind. CO2 is a nutrient and is necessary for photosynthesis by plants and phytoplankton. CO2 is a green-house gas. It is called a green-house gas because of its ability to retain heat within the Earth's atmosphere, like insulation. Green-houses are used to grow plants and are warm environments in which the CO2 is often artificially increased to 1,000 ppm which is around 2.5 times the normal atmosphere concentration of 390 ppm. Yet green-houses are very rich environments in which life flourishes. Plants and animals do not die in green-houses. The reason CO2 is increased in green-houses is to stimulate growth. Could it be that CO2 is actually good for the planet? CO2 nourishes crops and improves agricultural yields. Rather than CO2 destroying the planet it will assist agricultural industries and improve nutrition in developing nations. Based on extrapolation of data from an article published in the British Medical Journal by Keating et al (2000), Lomberg concludes that the average heat related deaths in Europe are 200,000 per year, but cold related deaths are 1.5 million. Global warming is not a threat to life on Earth. Global cooling on the other hand is. Life flourishes in green-houses, not in fridges and freezers. CO2 has been criminalised as a pollutant when clearly it is not. This is similar to the demonisation of cannabis in the 1930s when it was labelled a narcotic, even though it had many useful applications which society had been using for centuries including in tinctures and as hemp. Uses included medicinal, construction, rope, textile and as a renewable biomass fuel. Less CO2 would result in loss of plant and animal life. What came first? The carbon or the sweat? The basic premise of anthropogenic climate change theory is that the world is warming as a result of man-made increases in CO2. Yet it is likely that the inverse is true; that the increase in CO2 is the result of a natural increase in global temperatures. Apart from the issues mentioned earlier regarding the affect of clouds on temperature, there is also the relationship between water, CO2 and increased temperature. Cold water holds more CO2 than warmer water. As water temperatures rise, more CO2 is released from the water. It is probable that natural increases in global temperatures are warming waters, causing an emission of CO2 and contributing to increases in atmospheric CO2 rather than global warming being caused by man-made increases in CO2. The below graph shows the correlation between CO2 and Antarctic temperatures. Generally there has been around an 800 year lag from a rise in Antarctic temperatures to a corresponding rise in CO2. Note, that YD relates to the "Younger Dryas" cooling period and BA relates to the "Bølling/Allerød" warming period. Both of these mainly affected methane and occured in the North Atlantic. These and other studies show that CO2 is not driving temperature, but that temperature increases drive increases in atmospheric CO2 through off-gassing from water and soil. In terms of Greenland, both satellites and the IPCC reports show that while Greenland is losing mass around the edges, it is accumulating mass in the interior as a result of increased rainfall resulting in increased levels of ice. It is estimated that sea levels will rise by 34.5cm over the next 100 years and of course this is being attributed to anthropogenic global warming. However, this rise will be reduced by 5.5cm because even with warmer global temperatures, Antartica will not noticeably melt as it is so cold there (around -34oC). Additionally, high global temperatures will result in more rain and cause Antartica to accumulate more ice, reducing sea levels by 5.5cm. The net sea level rise over the next 100 years will therefore be 29cm. Equivalent to the sea level rise since 1860. This increase is based on the IPCC's own projections. Modelling has shown that reducing carbon emissions may have a minimal reduction in sea levels, in that by 2100AD, sea levels "might" rise by 1cm less than a "business as usual" model. Sea levels are rising, but not by anthropogenic causes. The focus on carbon emissions is dangerous and will cost lives and land. Rather than focus on carbon reduction, governments are better off to implement flood mitigation strategies for low lying lands and relocate people at risk of inundation. Another claim is that there will be water shortages as a result of global warming. Yet there is plenty of water falling across the globe every year. The world is not short of water. The problem is that it does not fall uniformly across the planet. So the challenge is getting clean water and sanitation to everyone. arranging for products which require high water consumption in their production, to be produced in areas with higher precipitation and export them to areas with lower precipitation. A2 is the standard scenario if no action is taken; that is ongoing economic development with a regional focus by individual countries. B1 is the solution preferred by the IPCC, that is an environmental solution with a global focus. A1 presents the best opportunity for the world to work together cohesively and use the vast amount of global wealth to improve the world on a global basis. The losses in A1 and B2 will directly affect the world's poor. The $3,005 trillion earned in A1 will greatly assist in alleviating poverty, hunger, health and education issues. Focussing on climate change will not only cost $553 trillion but also cost the world the opportunity to direct $3,005 trillion towards direct and lasting improvements economically, socially and environmentally. Warming and cooling of the planet is part of the natural climate cycle. There will be increases in temperature followed by increases in CO2. This does not mean that man is to blame for it. Nor does it mean that man should spend trillions of dollars because of fear mongering as climate change believers that the end is nigh. Every generation for millenia has had their share of doomsday prophets declaring the imminent destruction of the world. Generally, these claims are based on religion, superstition or failure to understand natural scientific events, such as eclipses, earthquakes and volcanoes. Anthropogenic global warming fear campaigns are tantamount to the prophets and witch-doctors of generations gone by prophecying that the world is doomed and making the science fit the fear. Of course, these disasters would be averted with a suitable sacrifice to the "gods" which invariably lined the pocket or larder of the afore-mentioned prophet. Anthropogenic global warming is the modern version of ancient doomsday fear campaigns which will line the pockets of government and business while robbing the average citizen. identify and develop sustainable, renewable energy sources (e.g. biomass fuels, geothermal energy) to replace fossil fuels as there will come a time when the world reaches "peak oil". The focus on carbon emissions and man-made climate change is distracting from more effective strategies that will improve and sustain life on Earth. 1. Richard Courtney, 'Global Warming - How It All Began', http://www.john-daly.com/history.htm accessed 1 May 2011. 2. Bjorn Lomberg (2010), 'Cool It - the skeptical environmentalists guide to global warming', Marshall Cavendish Edition. 7. 'Temperature to CO2 ' published 19 April 2001, on http://www.john-daly.com/press/press-01a.htm#PROOF and developed from a paper entitled 'Atmospheric CO2 Concentrations over the Last Glacial Termination' by Monnin et al, published in 'Science, vol. 291, p.112, 5 Jan 2011'. 8. http://www.co2science.org/articles/V6/N26/EDIT.php which summarises the findings of a number of scientists, including Caillon N., Severinghaus J.P., Jouzel J., Barnola J.-M., Kang J., and Lipenkov V.Y., 2003, 'Timing of atmospheric CO2 and Antarctic temperature changes across Termination III' published in 'Science 299: 1728-1731'.